Jazz guitarist and composer Michael-Louis Smith’s modern straight-ahead sound was influenced by many jazz greats, but is firmly rooted in originality. His unique style will draw upon almost any genre in an effort to explore and expand the possibilities of the music. Michael moved to the New York City area from the Capitol District in 1999 to attend the Conservatory of Music at Purchase College where he studied with of many of today’s jazz greats. Since earning a Masters in Music in 2005 Smith resides in NYC and continues to compose music for and tour regionally and nationally with the various ensembles he leads as a self-managed, independent artist (see below). The brand new album Portrait of MLS, due out in April 2010, features seven original compositions including the jazz/pop favorite “Up in the Air” performed by a who’s who of upcoming NYC jazz musicians Stacy Dillard on tenor and soprano saxophones, Theo Hill on piano, Gregg August on bass and Rudy Royston on drums. MLS Trio is a place where more often than not new music is debuted and worked out. Due to the paired down set up the musicians can explore the music and really stretch out. 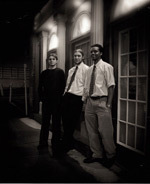 Although audiences have enjoyed live performances of MLS Trio over the years, the first studio recording was done in 2009. 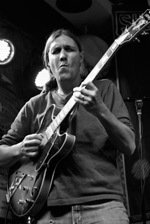 The album, for now simply titled “ Trio 09’ ”, features MLS on guitar along with frequent collaborators Robinson Morse on bass and Steve Belvilus at the drums. The album consists of seven MLS original compositions in a myriad of styles including the West African inspired “Hi Life”, the down-tempo rock piece “Gone”, a be-bop rhythm changes ”Come Again” free-blues “The Freedom Zone”, the sad yet hopeful country/Americana piece “Promised Land” and more. To listen, visit www.myspace.com/michaellouissmithtrio .